A community turned upside-down by the social changes of the 1970s. Seen through the eyes of a young man newly fled from his straight-laced Dutch upbringing, the fishing village of Bamfield on Vancouver Island’s pristine west coast is the unlikely meeting place of an uneasy mix of fishermen, the Dog Salmon whaling clan, hippies, drug peddlers, and the scientists and students of the Bamfield Marine Station. "Forests, beaches and docks replace alleys, boilers, and defunct canneries as Druehl brings the spirit of Cannery Row alive with a story of desire, conflict, and discovery along the remote shores of Vancouver Island. Artful description of the intricate relationships among its inhabitants exposes thepeculiarity of a village with such a unique mixture of cultural oddities that readers will trek the long logging road just for the experience. Cedar, Salmon and Weed is lavishly human." 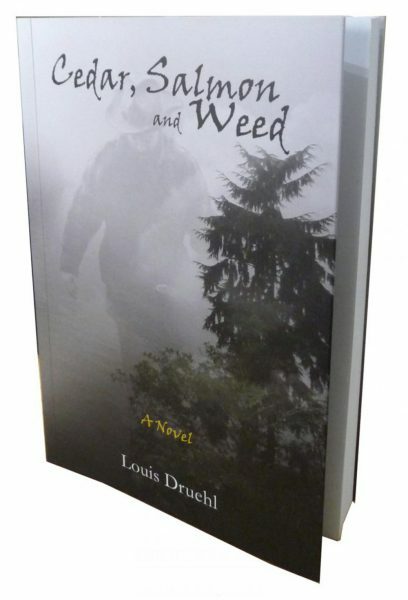 "Like a cross between The Beachcombers, The Nature of Things, and Up In Smoke, Bamfield, BC author Louis Druehl has crafted a brilliantly authentic West Coast novel. Expertly and beautifully written, the book absolutely drips with soggy coastal flavour, so much so that I could taste the salt air, and picture the harbour, ocean and land where so much of the action in this wonderfully gritty book is set. I highly recommended Cedar, Salmon and Weed& for anyone who enjoys adventure stories from a local expert's detailed perspective." "In this entertaining novel, consummate observer of human behaviour Louis Druehl takes the reader to life at the end of the road. In this often humorous and sometimes sad book filled with natural history vignettes, Druehl reminds us that cedar, salmon, and weed do not necessarily provide salvation from concrete, crowds, and cocktails - or ourselves. An enjoyable and insightful read." "Louis Druehl takes you off to a roaring start as he introduces characters that come alive from the 1970's, then brings them home with the tunes we remember. The graphic description of devastation to rocky shore sea life as oil moved in from a grounded freighter should be read by all those making decisions on oil tanker traffic. The juxtaposition of the muted sounds in a forest, the cacophony of a chainsaw felling a tree, the serenity of a calm sea, and the potential disaster from storm waves all make for compelling reading." "Bamfield is a coast village in the old style where denizens still get about by boardwalk or boat, and nobody knows its secrets like Louis Druehl. This novel would be worth reading just for the coastal ambiance, even if the story weren't such an energetic romp." "Bamfield is a British Columbia coastal community with a split personality. There is West Bamfield with its picture-perfect pioneer houses, East Bamfield with its cluster of commercial docks and tourist lodges, and finally end-of-the-road Bamfield, populated by transient students, failed fishermen, gooseneck barnacle pickers, beer-soaked dropouts, and pot farmers with their Bamfield Gold plantations rigged high in the branches of old-growth forests. 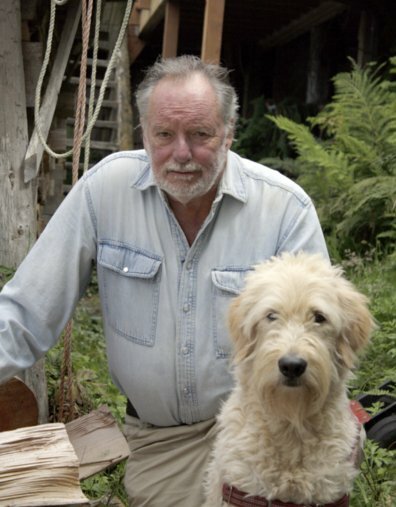 Bamfield resident and marine botanist Louis Druehl captures this untidy, imperfect world in his novel about human flotsam and jetsam stranded on the kelp-strewn beaches, content, like Gaz and his girlfriend Heidi, to live their dreams, to watch sunsets, to be with friends." The author with his dog, Brady.